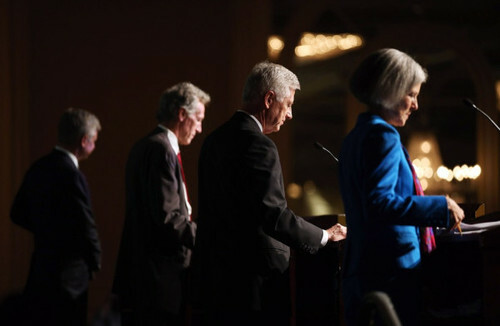 Last Tuesday night I attended the Free and Equal Debate, which gave Jill Stein (Green Party), Rocky Anderson (Justice Party), Virgil Goode (Constitution Party), and Gary Johnson (Libertarian Party) a platform on which to speak. I’m not a fan of our current (supposedly) democratic, two-party system and when I heard Jill Stein was arrested for trying to be a part of the televised debates, even though she and Gary Johnson are legally allowed to be involved due to the number of ballots they will be on in November, I got pretty frustrated. Two friends and I made a list of topics that these third party candidates addressed that we did not hear mentioned in the televised debates (please let me know if I’m wrong, I admittedly did not watch 100% of every debate). It’s also notable that, even though the stakes were understandably different in this debate, all candidates were friendly and non-combative. Thoughts? What would you like to hear mentioned?